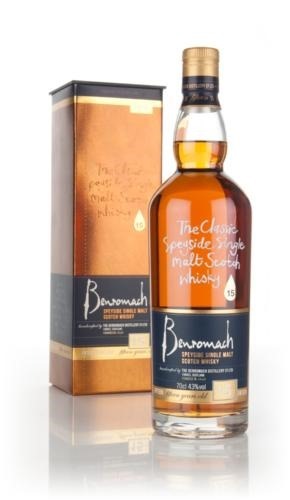 The Benromach 10 year old and its Cask Strength sibling the 100 proof have been favorites of mine for quite some time now, both priced very competitively at a level few other whiskies can even come near. I was quite happy to be able to try the new 15 year old in a twitter tasting held last night. The lineup was quite brief : the 10 and the 15 (It would have been nice to have the 100 proof, just to put them head to head). We started with the 10 year old , which is an old school kind of whisky with just the right balance of smoke / sherry / fruit, I wont bore you with the tasting notes again, but you can find mine here for both the 10 yo and for the 100 proof 10 yo. After most agreed the 10 year old is a cracker (and sold under 30 quid in some places – for example at the Milroy’s of SOHO– good price lads! ), we went on to try the 15. The 15 year old is a bit different than the 10 not only in maturation time, but also in wood regime. It is also a vatting of both ex-Bourbon and ex-Sherry casks, but the sherry ratio is much higher here, as we’re about to find out soon… The color also gives it away being much darker than the 10. Ok, now that we’ve got all the technicalities sorted, let’s taste it. shall we? Nose : Much bigger in sherry than the 10 yo and the CS, which is not really surprising given the higher ratio of sherry vs Bourbon on this one. Deep and fruity : Plums, sultanas, dried fruit compote ( more figs) , really deep stuff, then the signature smoke comes into play, there are some brazil nuts too and an earthy note to it, a touch of rum, orange marmalade. Palate: Deep sweet sherry, chocolate fondant, sugared orange peel, cocoa. Sweet, with vanilla, white pepper, all those lovely dried fruit come into play again. ginger and mint, maybe after 8 chocolate in rich dark treacle? Finish: Orange Marmalade, vanilla, milk chocolate, cinnamon, nuts. This is a yummy whisky, and If I am asked which was my favorite, It is really hard to answer that, since both are gorgeous drams. While the 10 is less intense on sherry, but offers more smoke, the 15 is indeed thick , sweet, and quite sherried. They both would be very welcome , but at different times and on different moods. The 15 is more of a winter / autumnal dram, while the 10 is not a light whisky by no means, but is less intense on the sweet notes, and for some will present a better balance between smoke, sherry, dried fruit. If I had to choose only one I’d go with the 10 by a very small margin. There are certainly some evening where the 15 would fit me more… At any rate, this is a top notch dram, and while it’s more expensive than its younger brother by some 15 quid, it is well priced. I do want a bottle or two of this too, It’s a whisky you need to have handy and at that price, it’s really a no brainer as well. Well done G&M and well done Benromach. Showing us well made, quality whisky, can be had for a reasonable price. many thanks to Benromach (and Steve of the whisky wire) for the samples, and for hosting a lovely tasting event online. Disagree. I had the opportunity to visit the distillery and was kindly offered a taster of the 15 year, having recently finished off a 10 year. Yes, they are similar, with the 15 year less peaty etc as you described. However, for me, the smoothness and richness of the 15 year stand out. It really was superb. I was told that the 25 year is in preparation. I did like the 15, but i do think the 10 offers a better VFM, and less sherry enables you to feel the malt profile better.